Anna Ancher (1859–1935), Two Little Girls Being Taught How to Sew (1910), media not known, 64 x 54.4 cm, Skagens Museum, Skagen, Denmark. Wikimedia Commons. In the first of these three articles, I looked at paintings of women sewing by hand from Velázquez in the 1640s to Renoir in 1882. This article concludes coverage of hand sewing from then into the early twentieth century. Nicolae Grigorescu (1838–1907), Old Woman Darning (date not known), cardboard, 55 x 40.5 cm, Muzeul Național de Artă al României, Bucharest, Romania. Wikimedia Commons. 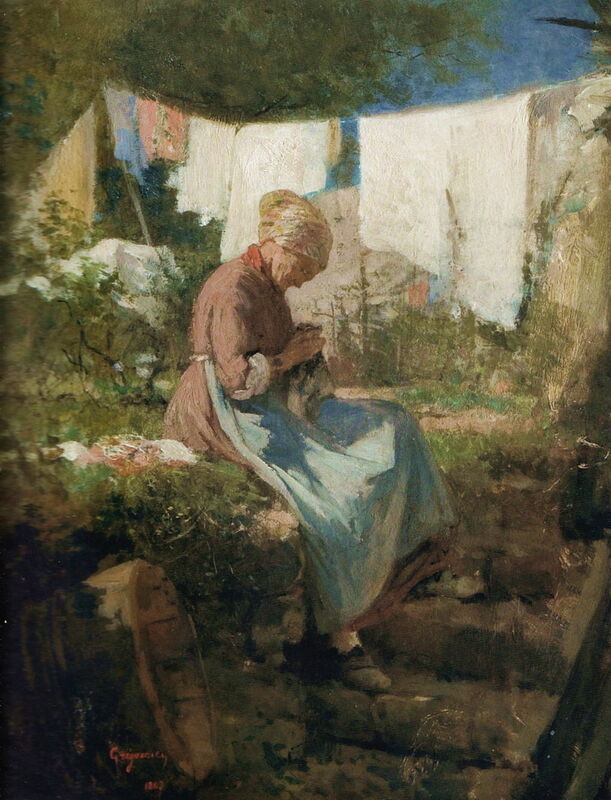 I suspect that Nicolae Grigorescu’s undated Old Woman Darning was painted in or near Vitré in Brittany, where he painted en plein air during the 1880s. She is sat in the sunshine on the grass of her wild garden, against a backdrop of washing, her clothing plain and intended for such chores. She has brought out a small pile of clothing which needs her sewing skills, and rests on the grass next to her. Her sewing is an opportunity to escape from her cottage and enjoy the fine weather. Vincent van Gogh (1853–1890), Woman Sewing (1885), media and dimensions not known, Van Gogh Museum, Amsterdam, The Netherlands. Wikimedia Commons. My second painting by Vincent van Gogh dates from 1885, when he was painting the rural poor in Nuenen, and shows a Woman Sewing. Sewing relies greatly on vision, and that vision on light. With their small windows, the cottages here were generally dark and gloomy, forcing this woman to position herself diagonally to the incoming light. This lighting effect transforms the painting, with her hands represented by simple brushstrokes for the thumbs and forefingers alone; she has also become faceless with full shadow. Ferdinand Hodler (1853–1918), Seamstress (1885-87), oil on canvas, 26.7 × 21.6 cm, Private collection. Wikimedia Commons. 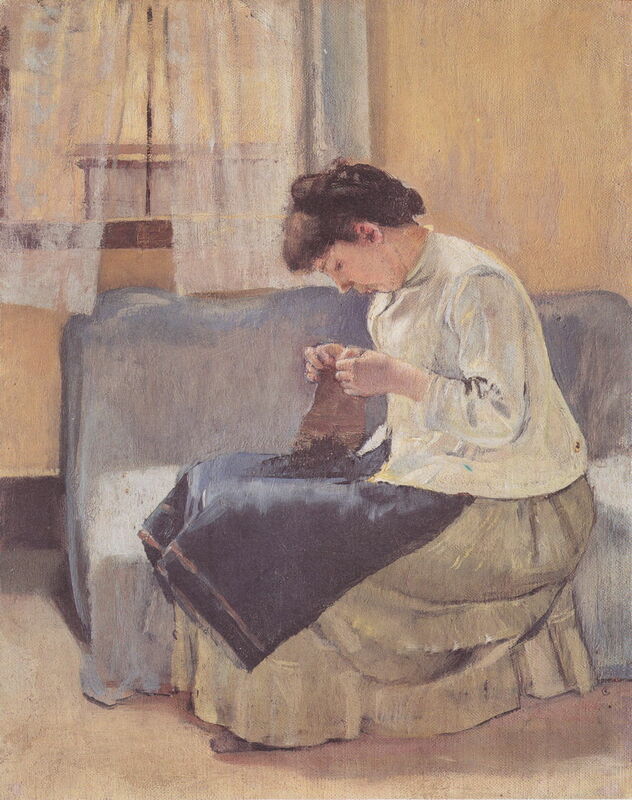 Ferdinand Hodler’s Seamstress from 1885-87 enjoys the brighter and more even lighting in a living room, where she bends her head over her work, withdrawn in her concentration. 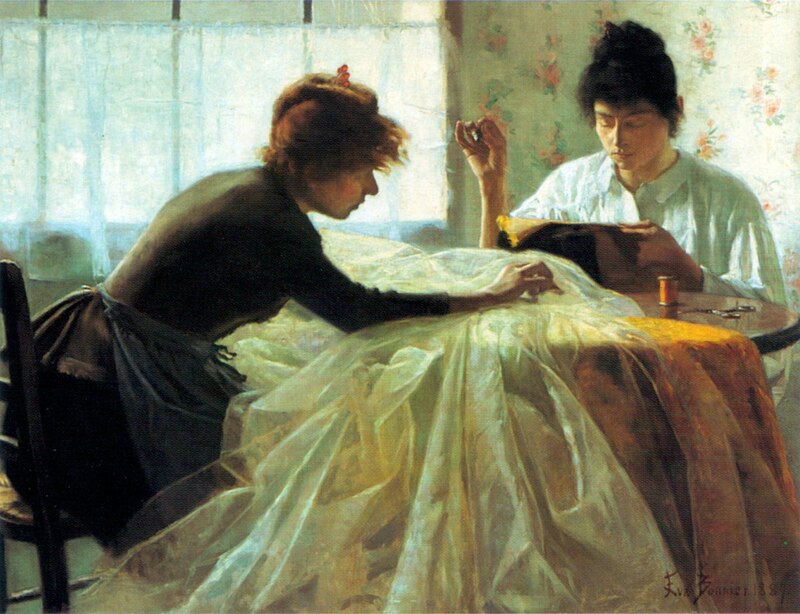 Eva Bonnier (1857–1909), Dressmakers (1887), further details not known. Wikimedia Commons. Eva Bonnier was a fine Swedish portraitist, whose Dressmakers (1887) explores very different effects of backlighting. Two women are collaborating on the making of a dress for a special occasion, although here they are working quite independently, each almost oblivious of the other. The woman to the right wears a thimble, and sews with orange thread, her scissors left open on the table in front of her. 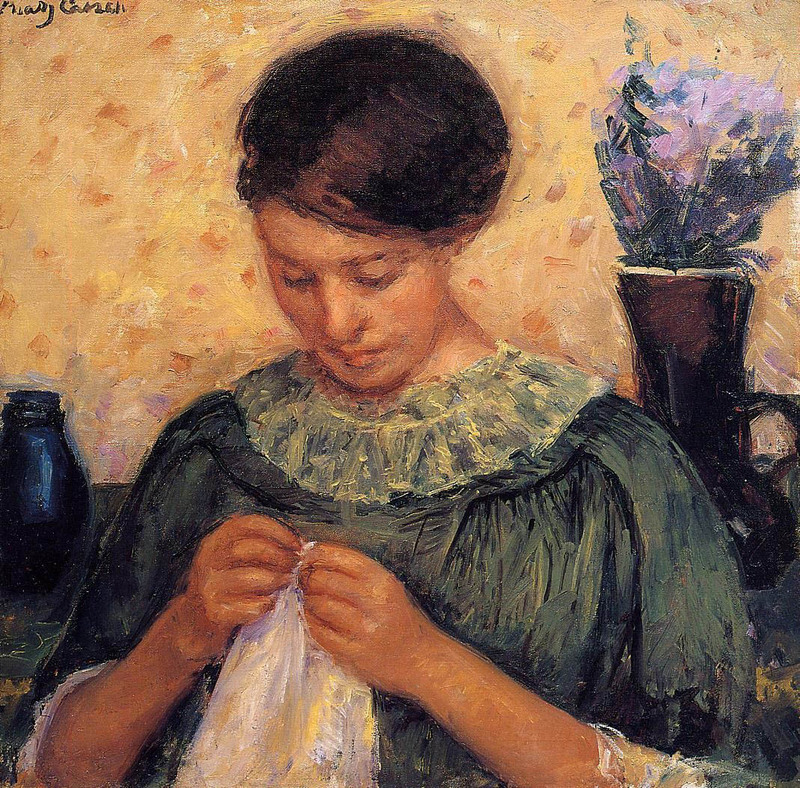 Mary Cassatt (1844–1926), Woman Sewing (date not known), further details not known. Wikimedia Commons. Mary Cassatt’s undated Woman Sewing may have been painted in the 1880s, and is another plain view of a woman at her needlework, with a vase of lilac-coloured flowers behind her shoulder. It is reminiscent of the far earlier painting by Velázquez, expressed using Impressionist colour and brushwork. 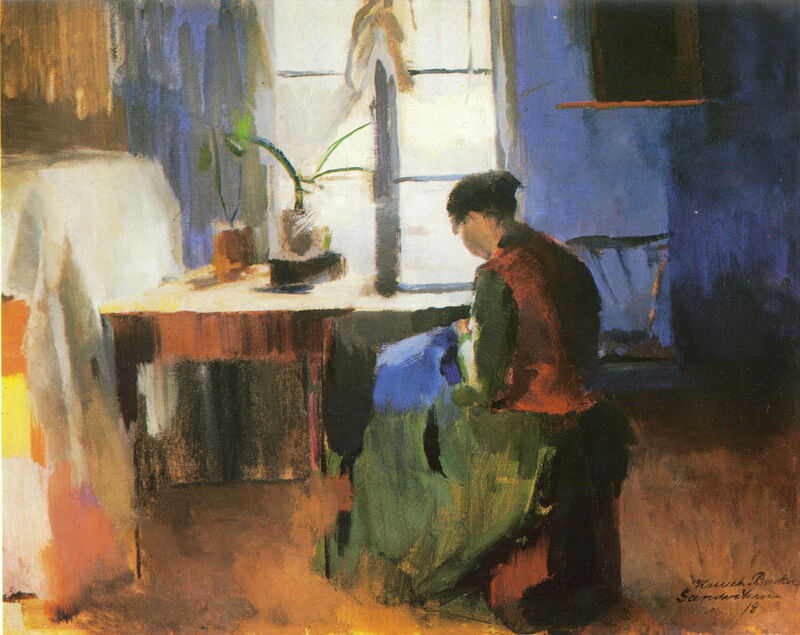 Harriet Backer (1845–1932), Kone som syr (Woman Sewing) (1890), oil on canvas, 33 x 41 cm, Private collection. Wikimedia Commons. 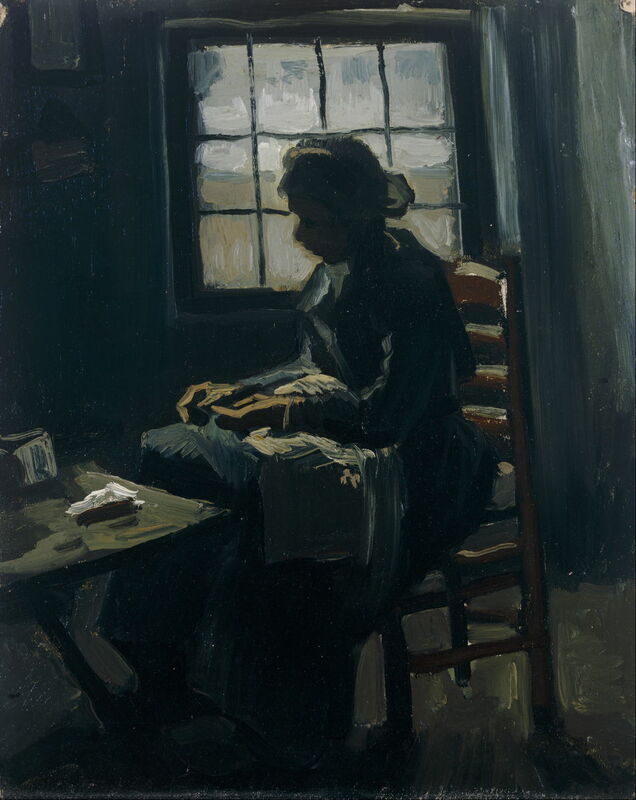 Harriet Backer’s Kone som syr (Woman Sewing) (1890) looks contre-jour into the bright light flooding in through the window, as a woman (designated a wife in the Norwegian title) sits at her sewing, retaining complete anonymity as she faces into the light. A quick oil sketch, its highly gestural depictions of potted plants, table, and chair go beyond Impressionism. Pierre-Auguste Renoir (1841–1919), Christine Lerolle Embroidering (c 1895), oil on canvas, 82.6 × 65.8 cm, Columbus Museum of Art, Columbus, OH. Wikimedia Commons. In Christine Lerolle Embroidering from about 1895, Renoir shows the older daughter of the artist, patron and collector Henry Lerolle. She is working with an embroidery frame made of bamboo. Christine would have been eighteen at the time that this was painted, and was already a favourite of Renoir’s. In the background, her father and a friend are studying one of the paintings in the family collection. Emil Rau (1858-1937), Young Couple in Front of a Farmhouse in Upper Bavaria (date not known), oil on canvas, 110 x 132.5 cm, location not known. Wikimedia Commons. 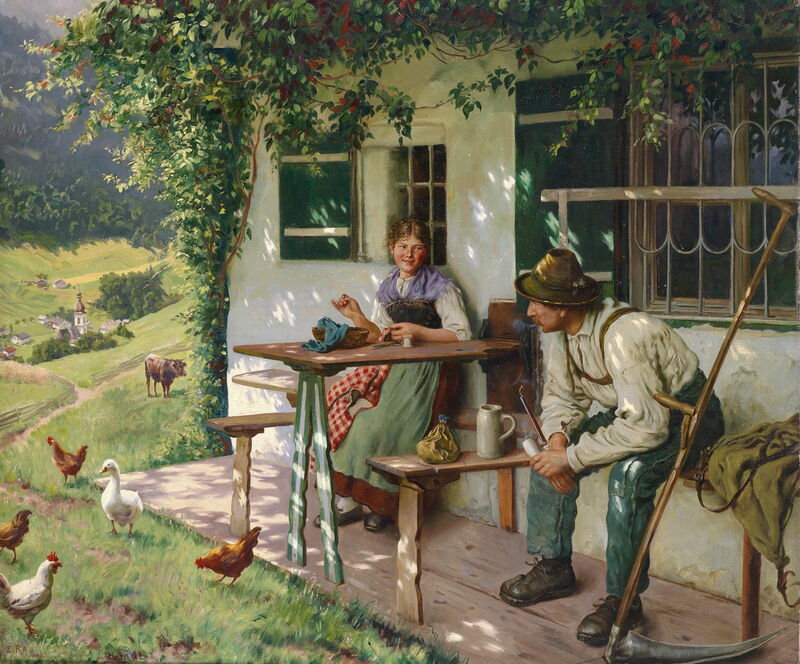 For the German painter Emil Rau working in Munich, wifely sewing was part of the domestic bliss of this Young Couple in Front of a Farmhouse in Upper Bavaria (date not known). The pink-cheeked young wife sits looking lovingly at her husband, not paying attention to her needlework. Rau’s work was frequently used as illustrations in the popular family newspaper Die Gartenlaube. Eugene de Blaas (1843–1932), The Friendly Gossips (1901), oil on canvas, 97.8 × 121.9 cm, Private collection. Wikimedia Commons. Eugene de Blaas was an Austrian artist who painted mainly in and around Venice. 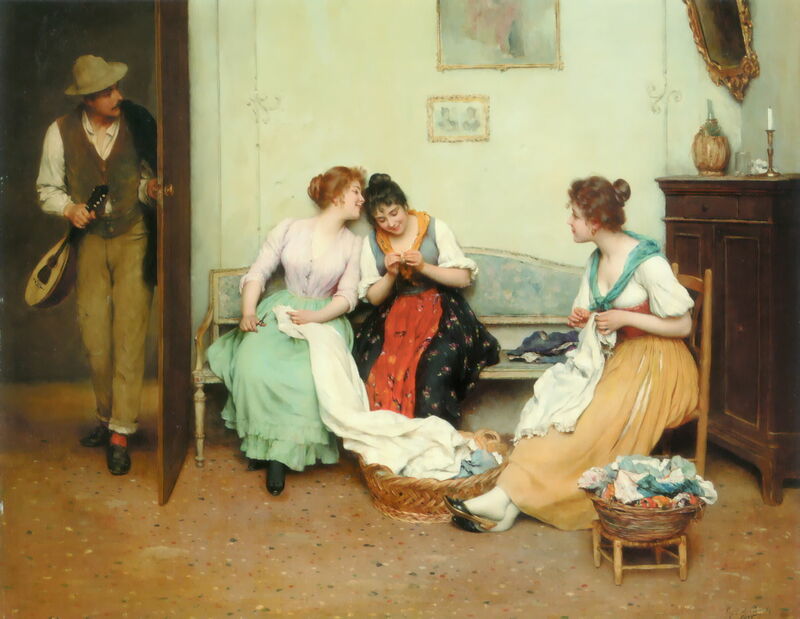 His painting of The Friendly Gossips from 1901 shows the social side of sewing, as three young women chat and joke together while they work through their sewing and repair baskets. They are most probably unmarried daughter(s) and friend(s) within a middle class home, and the young man peering cautiously round the door looks as if he has arrived to woo one of them. 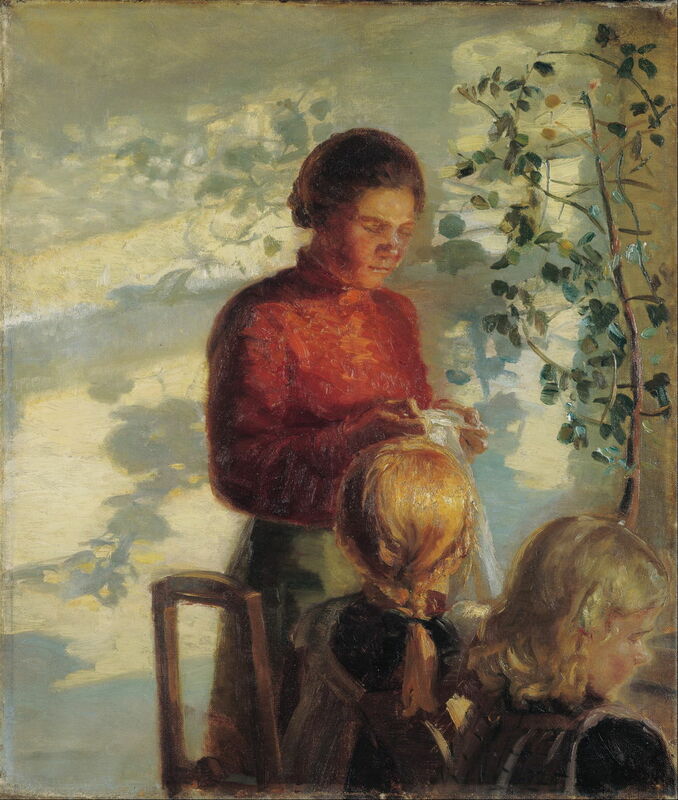 Following her earlier marvellous explorations of light and its effects, Anna Ancher, the Danish Impressionist and Skagen artist, painted Two Little Girls Being Taught How to Sew in 1910. The girls’ mother/teacher stands sewing in the rich light from a window to the right. Cast shadows on the plain pale lemon wall behind are complex: the sun is low in the sky, and those shadows fall from a large houseplant at the right, and external branches too. Edmund Blair Leighton (1852–1922), Stitching the Standard (1911), oil on canvas, 98 × 44 cm, Private collection. Wikimedia Commons. Edmund Blair Leighton was one of the last British academic painters, who specialised in legend from the age of chivalry. In Stitching the Standard from 1911, a young princess sits in a cutout at the top of the castle wall, sewing the black and gold flag to be flown from the castle. She comes straight from Arthurian legend, or a fairy tale, and emphasises how needlework was deemed an acceptable activity for women of all classes. 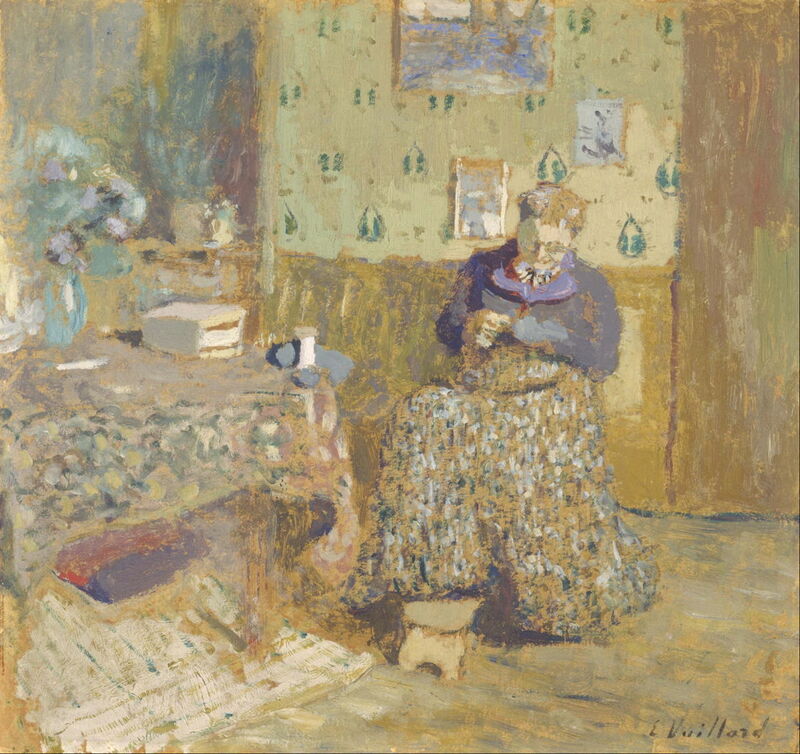 Édouard Vuillard (1868–1940), Madame Vuillard Sewing (1920), oil on cardboard, 33.7 x 35.8 cm, National Museum of Western Art 国立西洋美術館 (Kokuritsu seiyō bijutsukan), Tokyo, Japan. Wikimedia Commons. My final painting of sewing by hand takes us well into the twentieth century, in Édouard Vuillard’s late painting of his wife Madame Vuillard Sewing from 1920. Its colours and style show the remains of his time as one of the Nabis, but by this time he was largely painting portraits. Madame Vuillard doesn’t even look up, but continues to work on what looks like the darning of a pair of grey socks or gloves. Sewing by hand has, in general, remained thoroughly respectable, and an activity which can safely be shown of a woman. 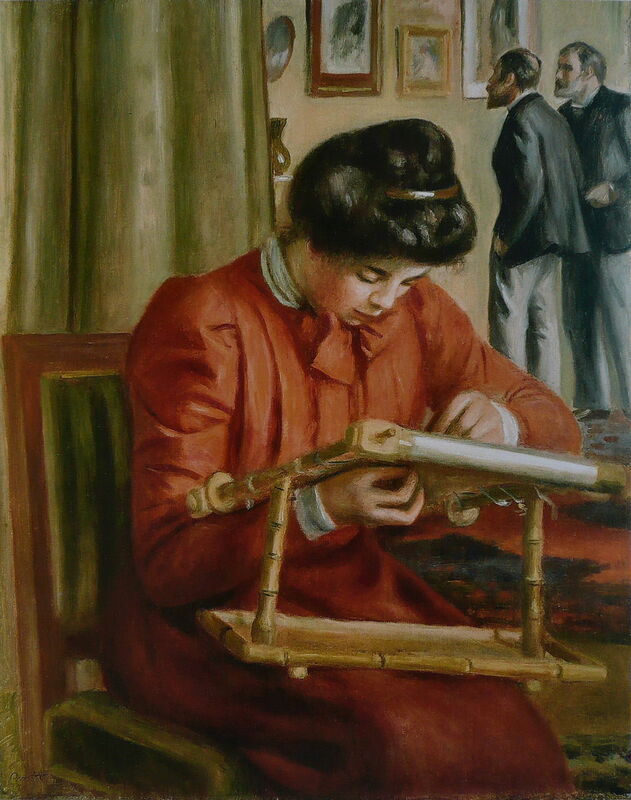 The artist can show one or more women concentrating on the close-held task at hand, or engaging in conversation with sewing as a thread of cohesion between them. They can emphasise the timeless nature of hand-sewing, its tranquillity, and intense concentration. Because sewing is demanding of vision, it is important that the act of sewing takes place in good lighting. The artist can use that to develop an image around backlighting (into the light, contre jour), with its high contrast, or across the image with resulting shadow play. But above all else, at least the act of sewing provided the opportunity for women to appear in their own right in paintings which were not simple portraits of them. My third and concluding article tomorrow looks at the impact of the sewing machine. Posted in General, Life, Painting and tagged Ancher, Backer, Bonnier, Cassatt, de Blaas, Grigorescu, Hodler, Leighton, painting, Rau, Renoir, van Gogh, Vuillard. Bookmark the permalink. “Her sewing is an opportunity to escape from her cottage and enjoy the fine weather.” Now, Howard, how would you know this? I suspect it is you who are enjoying the fine weather depicted in the painting. There is a typo in the text concerning the three young women and the man showing “to up woo,” or something like that. Thank you – I have corrected my typo. I think the perspective in the Rau painting appears odd because of its complete lack of middle ground in its extreme foreshortening. The image leaps straight from its abundant foreground to quite distant background, something that we would hardly ever see in real life. It’s an effect which he uses in other paintings too, so looks quite deliberate. It brings disparate elements oddly close together – for example, the closest cow (one of the few objects in any sort of middle distance) is close to the most distant chicken, and they are of almost identical size, as they are with the very distant church.